How many ladies named Olga, Daria, Anastasia, Kseniya, Masha, Anna or Tatsiana do you know? Or how about gentlemen called Dzmitry, Aliaksandr, Aliaksey, Ivan, Andrei, or Mikhail? Let us guess, at least 51 per cent of your acquaintances? Most parents in countries such as the Netherlands try to be most original when it comes to naming their newborn. Names like ‘Storm’ or ‘Sun’ show this quest for originality. Belarusian parents don’t seem to be struck by this phenomenon with Belarusian names. Quite the opposite is true as it seems many follow google’s most popular name list. And they don’t bother for their newborn to carry the same name as six other children in their future class. We have looked at the statistics and found out that from the year 1991 until 2010. 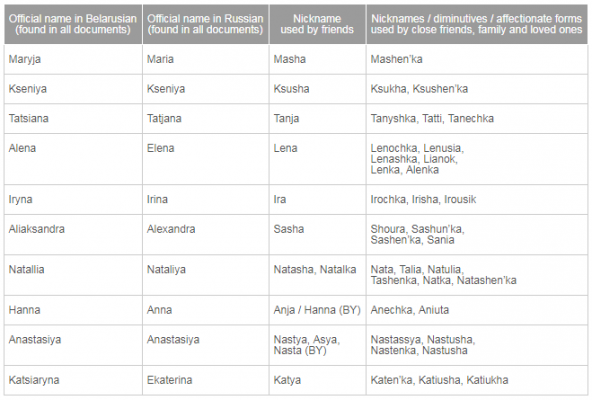 Anastasia, Maryia, Hanna, and Daria have been indeed dominating the Belarusian name market. This means that these names were in the top 10 from 1991 until 2010. The same goes for Dzmitry, Aliaksandr, Aliaksey, Ivan and Andrei. and comfortably sit on one chair, drinking one drink. Belarusians are not very original with the first names. But they surely make it up with their nicknames and diminutives of most first names. Welcome to the labyrinth of Belarusian names! Imagine you were dragged along to a birthday party of a friend of a friend. The birthday boy just introduced himself to you as Aliaksandr. A second later a friend of him calls him Sasha. Yet another refers to him as Ales’. Then his mom suddenly screams “Shura, your grandma just arrived, come and say hello”. So this guy has four different names, what is going on here?? You see, many Belarusians have this luxury when it comes to first names that change depending on the occasion. Belarusian names have one or more standardised diminutive forms (often with a “chka” or a “shen’ka” suffix added). And judging by the name-form a person is being called by, you can find out how close people are to one another. So, for example, names like “Aliaksandr” or “Natallia” would be used on official forms and documents (like a passport). As well as during business introductions. The less formal variants (“Sasha” and “Natasha”) might be used during more informal introductions. As well as friendly communication. Nicknames and affectionate forms (“Shura” or “Sashen’ka”, “Nata” and “Natashen’ka”) are used in the personal lives. Thus among close friends and family. To a foreigner this is a cause for a headache. Don’t be alarmed to find out that Vova, Uladz and Vladimir are the same person! How about Anastasiya, Nastya and Asya? The same person, too! 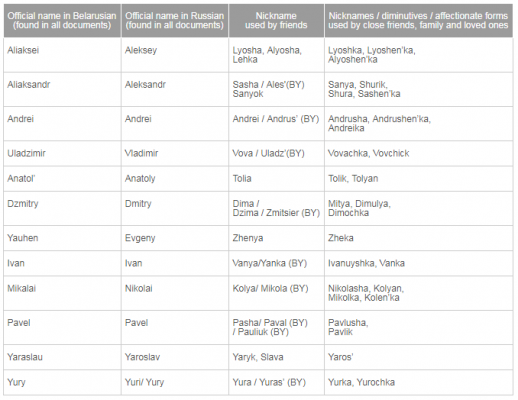 You might think that Belarusian and Russian names are identical. And we can not blame you for this thought because Belarus and Russia do share many features. However we can tell you that not only does Belarusian spelling of most names differ from the Russian language. Like the name Aliaksandr instead of the typical Russian spelling ’Alexander’ or Alena instead of Elena. But there are also more typical Belarusian names that should not be forgotten, but revived! Such as Alesia, Adela, Miron, Amila, Mira (from Miraslava), Viliana or Paulinka. And what about Arsen’, Ales’, Kastus’, Vincent, Janka, Jas’, Symon, Akim, Branislau, Vasil’, Zachar, Zianon, Franacysk, Liavon.